Every spring, summer and fall, I wait. I wait for fresh asparagus and chives. Then I wait for berries, tomatoes and corn. Then I wait for squashes, apples and cider. I wait, because I respect the seasons and their offerings, and buying in-season and locally goes hand-in-hand with my food ethics: Know the who, what, where and how of your food and the why will speak for itself. And here is another anecdote: A long time ago I lived in Spain with a family. We were very close and we keep in touch still. Isabél, la madre, is a tremendous cook and showed me many things in her kitchen — empanadillas de atún, croquetas, sopas and more. The ingredients in and preparation of Spanish food changed my life beyond its culinary sensibility. My adoration of it was heightened even more when i bought Penelope Casas’ The Foods and Wines of Spain. There was no need to look any further between my host mother and Penelope’s influences: I was hooked on Spanish food. So it will come as no surprise that I wait (and wait and wait) until the peak of the summer growing season to make one of my favorite Spanish dishes ever, gazpacho. Gazpacho basically consists of high quality tomatoes, green peppers, cucumbers, red onions and garlic. In The Foods and Wines of Spain, Penelope’s recipe calls for fresh or high-quality canned tomatoes, a pinch of sugar, red onion, garlic, Kirby cukes, red wine vinegar, green bell pepper and fresh tarragon. For a creamier consistency, day-old baguette slices become part of the mix. 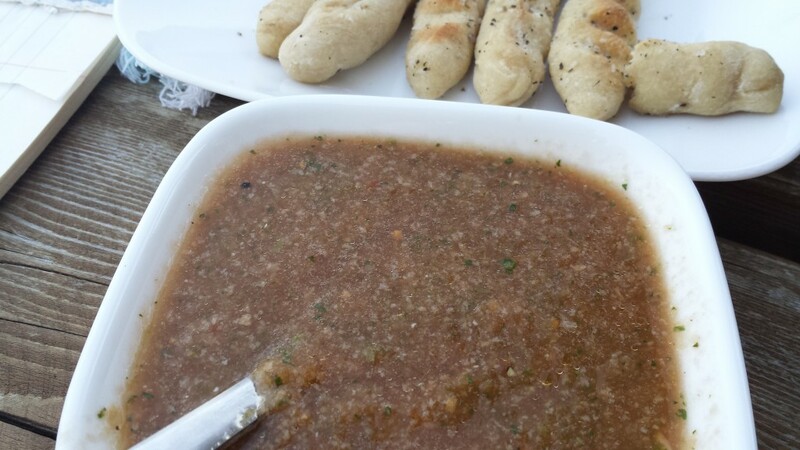 Keep the Heat Out of the Kitchen Gazpacho with Campfire Breadsticks. In keeping with the culinary traditions of France, Italy and Spain, where one buys locally and what is in season, I follow suit when it comes to my food-making, in particular for gazpacho, and modify accordingly. Flavors of anise are not popular in my tiny household, so I often include ripe (upturned) sweet basil and/or flat leaf parsley in place of tarragon. Sugar and red wine vinegar make a big difference, and so do the Kirby cucumbers and green bell peppers. During my last farm stand visit, there were no green bell peppers, so I used large jalapeños instead. Although they did not add the delicious green bell pepper, it made for a delicate piquant gazpacho. Scot also is not a big fan of onions, so I bought fresh green onions with plump white bulbs at the ends, which I used in lieu of red onions to satisfy us both. The bread will make it more traditional and andaluz, and cold water creates a soup-like consistency over a salsa-like one. A variation on it could include grilling or roasting the tomatoes, peppers, onions and garlic for a more campfire flavor. Make the soup, let it rest and serve it cold. We eat ours with our campfire breadsticks and it is so good. I believe that if you treat gazpacho respectfully by using only the freshest ingredients possible — those in season and locally grown — you will make gazpacho again and again. It rarely lasts more than overnight in our house (camper, that is). Scot slurps it down and Luna sips on its liquid, asking for more. Cold, crisp, flavorful, simple, elegant and utterly satisfying, gazpacho is perfect for camping or otherwise, cools us in summer and keeps the heat out of our tiny living space. 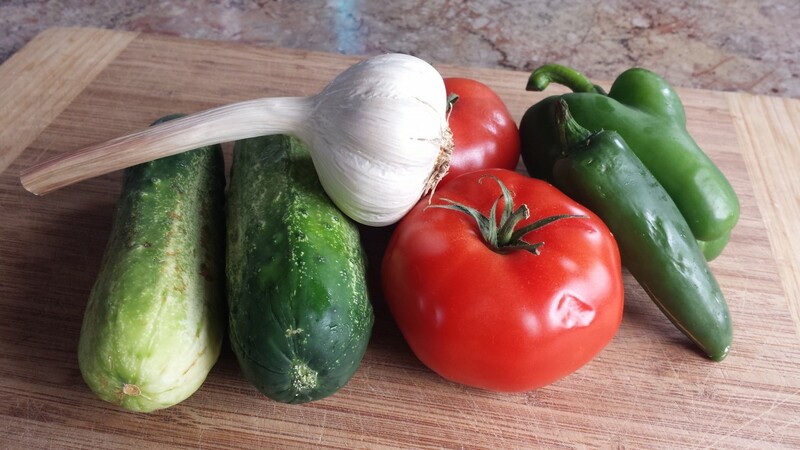 Go to the farm stand and pick up some fresh food for gazpacho and make it yours. Chop all of the vegetables and place them in a food processor with the water and pulse to create a finer dice consistency. In my tiny kitchen, I only keep a hand wand and a large mixing bowl. You can do the same. Just pulse with your hand wand and gauge the consistency of the vegetables and water. Let it sit for a few minutes and then sample your gazpacho. The melded vegetables will be delicious on their own, but this is an especially important if you used canned tomatoes as their will be added salt in them. For thicker gazpacho, prepare as aforementioned. Then, place bread slices into gazpacho and let them absorb some of the liquid for a few minutes. Blend until you have a creamier consistency. Chill. Serve with garnishes if you wish.